Can Dennis Smith Jr. Be A Long-Term Piece for the Knicks? 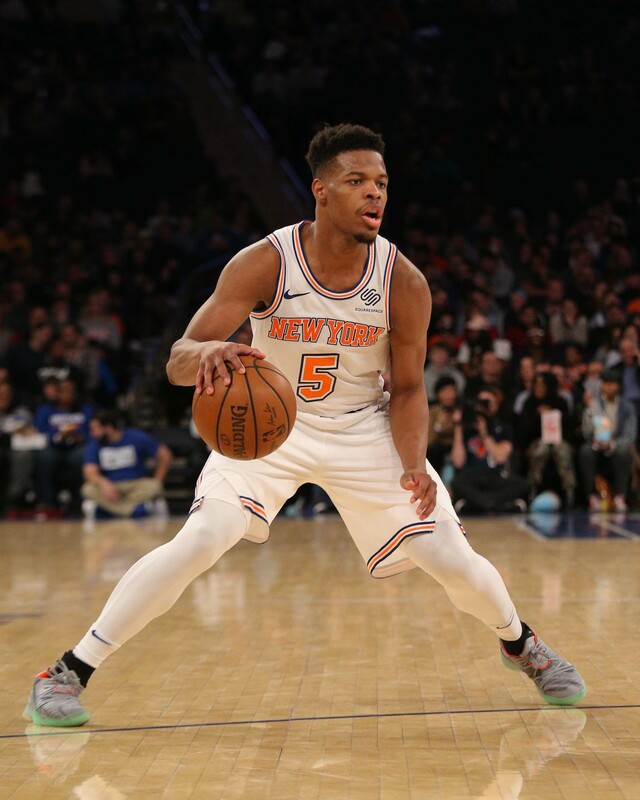 Home New York Knicks Can Dennis Smith Jr. Be A Long-Term Piece for the Knicks? Wow. What a whirlwind Thursday was. I went into chemistry class at 1:53 P.M central time in a world where Kristaps Porzingis was still on the New York Knicks. By 3:00 P.M ESPN Adrian Wojnarowski had dropped a bomb: Porzingis, along with Tim Hardaway Jr. Courtney Lee, and Trey Burke were going to the Dallas Mavericks in exchange for Deandre Jordan, Wes Matthews, Dennis Smith Jr., a 2021 unprotected first-round pick and a protected 2023 first-round pick (1-10). On Sunday, the former Mavs made their debuts. In a 96-84 loss to Memphis, Smith showed some flashes (eight points, six assists), Jordan played well (12 points, 12 boards), and Matthews struggled (five points, 2-8 shooting). Here at ESM we have some KP stuff out, so I wanted to look at the most interesting player coming our way in the deal: Dennis Smith Jr. Who is Smith, and can he be an important piece for the future? Let’s take a look. Smith Jr. is a 6-3, 195-pound point guard who is just 21 years old. He was a consensus top recruit coming out of high school and went to North Carolina State for a year. Dallas selected him with the 9th pick in the 2017 NBA draft. Ironically, Smith is the player who was selected one pick after Frank Ntilikina, and the collective Knicks fan base has followed him a little more closely than others. On the year, he’s averaging 12.9 points, 3.0 rebounds, and 4.3 assists per game on 44.0% shooting, 34.4% from three, and 69.5% from the line. While he’s extremely talented, Smith has had his struggles, particularly when forced to play off-ball this season with Luka Doncic in town. Like current Knick Emmanuel Mudiay, he’s a player who wants to have his ball in his hands, and has elite athleticism that allows him to go 100 miles an hour at all times. It’s well-known around the league that Smith has some people in his corner that may have inflated his ego. Like He-Who-Shall-Not-Be-Named (KP), he’s been told that he’s the best for a long time, and people like rapper J. Cole hyping him up doesn’t help. This probably means nothing, but it is something to look out for if he starts to struggle or lose minutes. The comparisons to Mudiay have also been drawn by Coach David Fizdale. “Very similar to what I told [Emmanuel Mudiay]: Don’t look over at me, don’t put your head down. Be yourself and we’ll work out the kinks,” Fizdale said. “[He’s] just a powerful, explosive guard who can get into the paint against anybody, who gets other people involved, who rebounds the ball. How Does He Fit In? He should get the majority of his minutes at point guard, and with Frank and Mudiay sidelined with injuries right now, that will be especially true in the short term. He’ll have every opportunity to show out over the final 30 games of the season. Maybe he can do enough to convince Knicks brass to pass on a point guard in the 2019 NBA draft. He is a perfect fit in Fizdale’s system, which allows its guards to push the pace and make mistakes. In Dallas, veteran coach Rick Carlisle grew tired of Smith’s frequent mistakes and bad decisions. He often opted to play veterans like JJ Barea and Devin Harris rather than suffer through the growing pains with Smith. Smith will have a lot of freedom, and, like Trier, Mudiay, Ntilikina, Knox, and Robinson, he won’t be benched for messing up. The potential fit with Ntilikina is intriguing. Smith can be TOO aggressive, and Frank is far too under-aggressive. Frank is a defensive specialist with really impressive passing vision who has shown little no ability to score. Smith is a natural-born scorer who could improve his passing and defense, especially. The two young guards complement each other nicely and have a chance to grow as the backcourt of the future. That is if the Knicks are unable to land Kyrie Irving or pass on Ja Morant. If Kyrie wants to come, all bets are off. Can He Be a Long-Term Piece? Absolutely. In what capacity? Well, that’s the question. Smith could commit to improving his defense and passing, become a better shooter, and ultimately be a starter with All-Star upside. He could also become a spark plug off the bench who can score but do little else. Smith played 146 minutes without Luka Doncic this season. His per-36 stats in that time: 17.5 points, 6.2 rebounds, 7.9 assists, 1.2 steals, 1.0 blocks and 1.5 threes on a 50% true shooting and a 24.1 usage rate with a plus-6.0 net rating, 10 points higher than the 4.2 it was with Doncic (Michael Gallagher on Twitter). With his blend of scoring, passing, and rebounding, it won’t take a lot for Smith to make a big jump. Additionally, it has been reported that he is “ecstatic” to join the Knicks, and a fresh start may be all the talented guard needs. Smith scored 13 points, grabbing 10 boards, and dropping 15 dimes on Wednesday against the Knicks. Here’s hoping Smith Jr. has many more performances like that at MSG.